The story goes that Seamus Blackley, one of the founding designer of the Xbox was doing some cleaning at home in the fall of 2016, when he found a prototype of the Duke, the original controller of the Xbox. Perhaps feeling cheeky, Blackley posted some jokes on twitter about his find and those jokes got traction. Someone eventually asked the million dollar question, “Could you re-release the Duke?”, clearly Phil Spencer, current head of the Xbox division was listening and reached out to Blackley about possibly pulling this off. A little over a year later this massive throwback to the sixth generations of consoles re-emerged a via 3rd party peripheral maker Hyperkin. 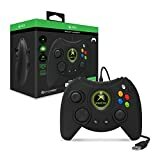 My first tinge of reservation regarding this product was the fact that Hyperkin will be the company putting this controller out. This is not to say I have no confidence in Hyperkin as a manufacturer, but I have been burned by them in the past. As the owner of two Retron 5s, I can confirm that both controllers that it came with were pretty unusable and I stuck with OEM controllers whenever I used my Retrons. However my nostalgia got the best of me and when this was available for pre-order any reservations I had no problem putting it into my cart. Upon receiving my Duke, I was greeted with a box which was comparable to the one that came with the Xbox One Elite Controller. After opening a box, I discovered a card underneath the quickstart guide which thanked everyone was involved with the project, names like Seamus Blackley, Phil Spencer, Aaron Greenberg, as well as shoutouts to the teams behind Halo and Jet Set Radio Future. So that card was a very nice touch. Underneath those two pieces of paper was the prize I sought, the Hyperkin Duke. I took it out of the plastic bag and immediately set it down next to its ancestor. From a distance, you could easily be fooled that two were released in the early 2000s. Reports mentioned that one of the stipulations was that the new duke could not stray design-wise and clearly the were able to get that done with some minor changes. Shoulder buttons were added and they mimic the functions of the white and black buttons. Sadly felt hard to press and I would probably rely on the white and black buttons. To accommodate the now ubiquitous home button that controllers now come with, the once vestigial center jewel has now been given function and a miniature LCD which outputs the original Xbox boot animation when powered on and when the button is pressed(which I wish this feature was something that could be toggled off, but this is an extreme nitpick). Another deviation is that the controller doesn’t have a permanently affixed cable with a breakout point. It instead has a USB Micro B port inside a crevice. I realized the crevice is to make sure supplied USB cable fits in tight and can’t snap due usage, but it also means that it is not compatible with all Micro B cables as some of them will have excess plastic which prevents it from reaching the port. The big test was how would the controller do while actually playing games. First it would’ve been sacrilege to not christen the controller by playing a Halo title. Utilizing Halo: Master Chief Edition, I was able to give the controller its first major test, and for all intents and purposes it passed with flying colors. It was like riding a bike, as I was able to wake up from cryo-sleep and escape the Pillar of Autumn like it was 2001. Playing Halo: Combat Evolved with this controller in 2018 just gave me a sense that things can be right in the world. The second test would test something the Duke was never that good for, and that would be fighting games. Breaking out Garou: Mark of the Wolves I wanted to see if the new Duke would have quietly remedied the original’s weakness. Sad to say the those results are inconclusive, as the western hemisphere of the d-pad was not really giving my consistent results when I tried to do the fireball motion. I will give the line the benefit of the doubt and just chalk it up as a fault of this specific unit alone. The Hyperkin Duke controller is exclusively available at Gamestop and the Microsoft store at the price of $69.99. At that price point you can get a regular Xbox one controller. So the unless you are big on nostalgia, the Duke isn’t something you need. But those who have been on this xbox ride it’s a small price to pay to get back something that takes you back to a simpler time. So if you’ll excuse me, I need to find my copy of Ninja Gaiden Black, ‘cause I’ve got to do some Izuna Drops!